VF. 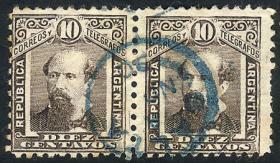 JALIL Guillermo & GOTTIG José Luis: Specialized Catalogue of Postage Stamps and Postal History of Argentina (2018/2019 edition), 2 volumes, hardbound, 728 pages. Free downloadable updates will be available for later issues. 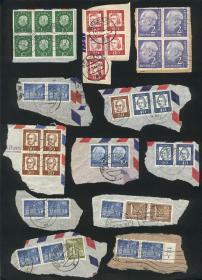 It includes ALL the Argentina stamps issued up until late 2018, with errors, varieties in perforations, papers, watermarks, etc., with photographs of catalogued varieties, and explanations to help the readers identify the different papers, printings, shades, etc. 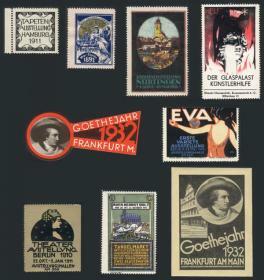 It also includes complete chapters (with details and varieties) on: Official stamps, telegraph stamps, Ahorro Postal, variable value stamps etc. 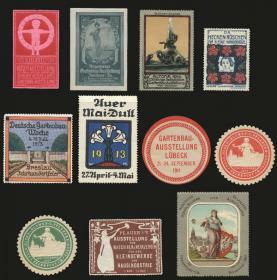 etc., POSTAL STATIONERIES (old and modern), PRE-STAMP MAIL (with details of each mark) and STAGECOACH MAIL (with good photos of all the existing marks). With fair prices in line with the current market. This is the most important work of its kind ever published on Argentina philately, an essential guide both for beginners and advanced collectors, and also for stamp dealers and investors. IMPORTANT: Heavy lot (3 kilos), shipping costs worldwide from Argentina will be approximately US$60, please bear this in mind before placing your bid. 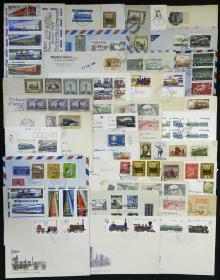 IMPORTANT: You can also purchase the catalogue DIRECTLY at our website www.JalilStamps.com, for a more immediate processing! VF. 4 Cinderellas + 1 small card, very old and of VF quality! Fine About 50 covers, cards, cover fronts, etc. 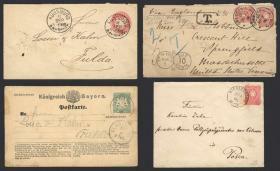 of varied countries and periods related to topic SPORT, with nice frankings and/or special postmarks, HIGH RETAIL RESALE VALUE, good opportunity! Fine About 50 covers, cards, cover fronts, etc. 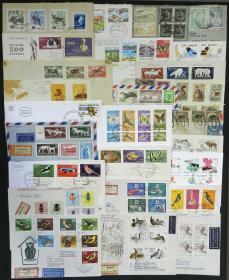 of varied countries and periods related to topic FAUNA, with nice frankings and/or special postmarks, HIGH RETAIL RESALE VALUE, good opportunity! 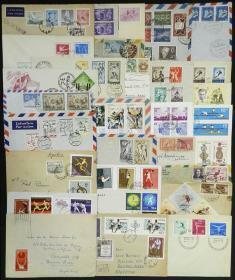 Fine About 60 covers, cards, cover fronts, etc. 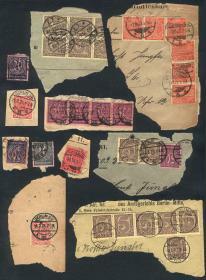 of varied countries and periods related to topic FAUNA, with nice frankings and/or special postmarks, HIGH RETAIL RESALE VALUE, good opportunity! 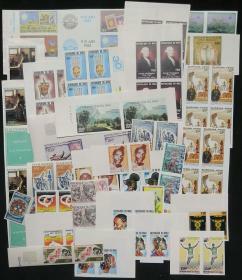 Fine About 100 covers, cards, cover fronts, etc. 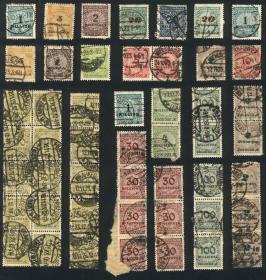 of varied countries and periods related to topic FAUNA, with nice frankings and/or special postmarks, HIGH RETAIL RESALE VALUE, good opportunity! 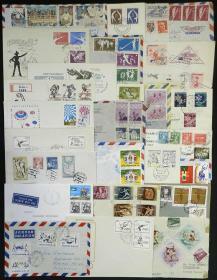 Fine About 80 covers, cards, cover fronts, etc. 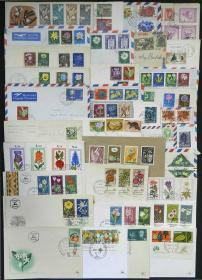 of varied countries and periods related to topic FLORA / FLOWERS, with nice frankings and/or special postmarks, HIGH RETAIL RESALE VALUE, good opportunity! 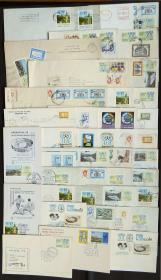 F.VF ARGENTINA 78 Football World Cup: Over 40 covers or cards with frankings and/or postmarks related to topic Football, very fine quality, some are very rare! VF. 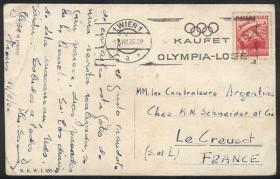 Special postcard sent to Argentina on 4/AU/1936, with postage and cancels topic Olympic Games, very nice! 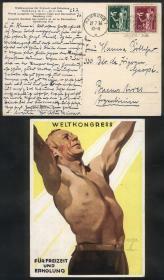 Fine Postcard sent from Wien (Austria) to France, with machine cancel: "KAUFET OLYMPIA-LOSE", corner crease, very nice! 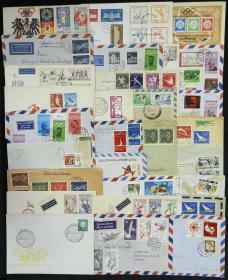 Fine About 43 covers, cards, cover fronts, etc. 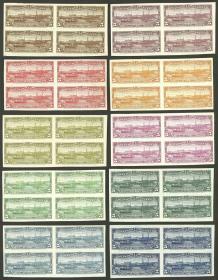 of varied countries and periods related to topic TRAINS, with nice frankings and/or special postmarks, HIGH RETAIL RESALE VALUE, good opportunity! VF. 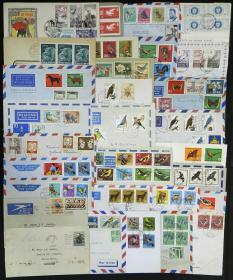 Lot of VERY THEMATIC stamps, mint never hinged and of excellent quality, good opportunity at a low start! VF. 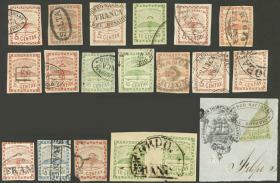 Former French colonies: Lot of imperforate stamps in pairs or blocks of 4, VERY THEMATIC and of fine to excellent quality, most MNH (some without gum), HIGH RETAIL VALUE, good opportunity at low start! 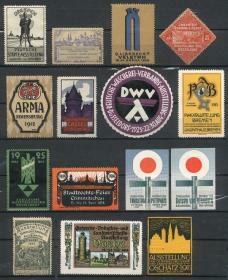 Ave-Fine Beautiful PC illustrated with old postage stamps, editor Ottmar Zieher (Germany), average quality. VF. Postcard (PAN AM Lockheed Constellation airplane) sent from DAKAR-YOFF to Argentina on 30/JA/1949, VF quality, nice thematic postage! VF. 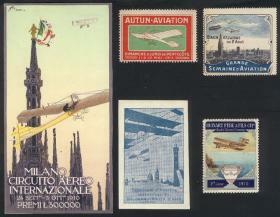 Michel 539y, 1934 Graf von Zeppelin 3Rm. 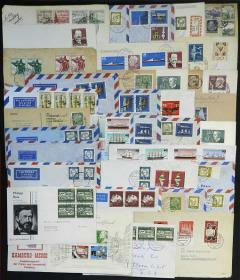 HORIZONTAL gum (horizontal ribbed paper), used, very fine quality, Michel catalog value Euros 600. VF. 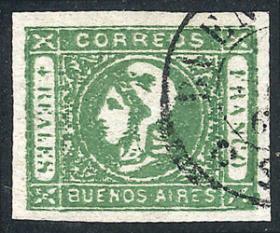 Sc.115, 1920 1.25Mk. on 1Mk. 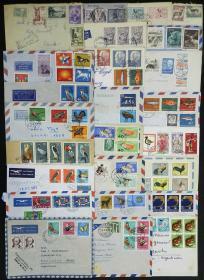 green, complete sheet of 20 MNH stamps, folded vertically in half, along perforation, excellent quality! 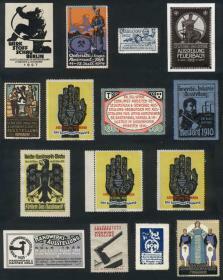 Ave Michel 426 + 427, 1928 Coat of arms, mini-sheet with stamps, gutters, tete-beches and labels. 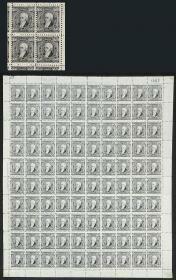 It includes Michel S55 and S59 among other "Zusamendrucke" (Euros 2,500), with defects (stained gum and several examples with thins), good opportunity at low start! VF. 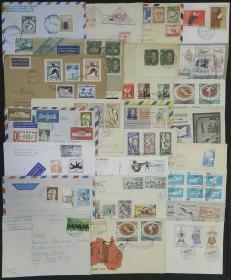 Lot of used stamps on fragments of covers, including many interesting postages, high catalog value, good opportunity! VF. 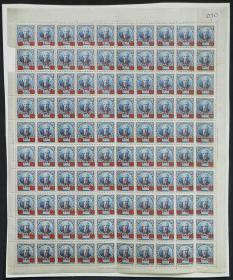 Sc.O10, beautiful used block of 30 examples, VF quality! 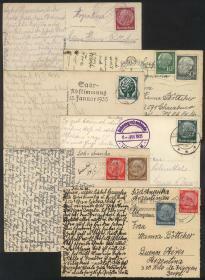 F.VF 1860/64: 10 Covers (1 is a front) or postal stationeries, varied postmarks and destinations, some very interesting, good opportunity at a low start! 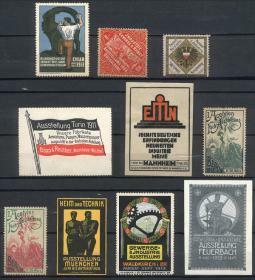 Fine 35 Covers, cards, etc. 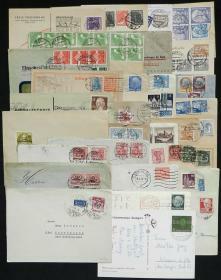 + 1 fragment of parcel post despatch note, used in varied periods, with very nice postages, interesting postmarks, etc.! VF. Postcard (view of Buckow, Märkische Schweiz) sent to Argentina on 16/JUL/1913, franked with 10Pf. stamp with interesting ""N..." commercial PERFIN, VF quality! 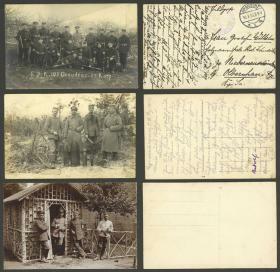 Fine Postcard with view of group of German soldiers in Graudenz, sent with military free frank to Olberhau on 10/MAR/1915. 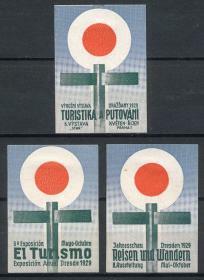 Also 2 other unused cards with very good views of soldiers (same origin as the other one), very interesting! 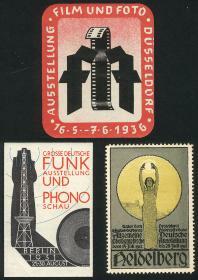 Fine FELDPOST postcard with interesting "K.u.K. 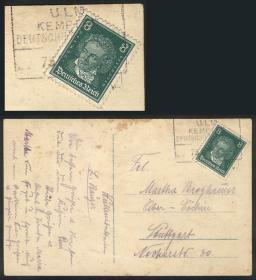 ETAPPEN POSTAMT" postmark of 27/JA/1916. 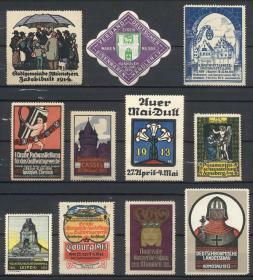 Fine Page with 16 stamps of the period with special postmark of 8/FE/1919: "WEIMAR - NATIONAL VERSAMMLUNG", fine quality (folds not affecting the stamps), interesting lot! 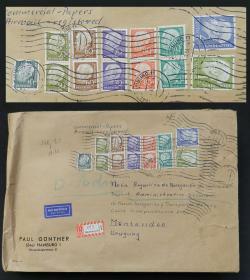 Fine Despatch note sent from Aachen to Hungary on 18/SE/1922, with spectacular postage of 270Mk., handsome! 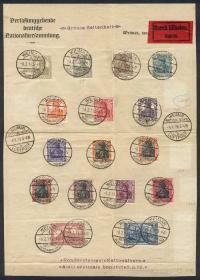 F.VF 8 Covers sent to Argentina between 1923 and 1924, with meter postages, some of HYPER INFLATION, interesting! VF. 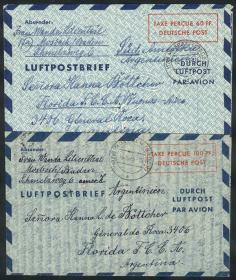 Cover franked by Sc.C37, sent by ZEPPELIN from Friedrichshafen to Sao Paulo (Brazil) on 10/OC/1928, with blue oval "Mit Luftschiff LZ127 befördert" marking, and New York transit backstamp, VF quality! 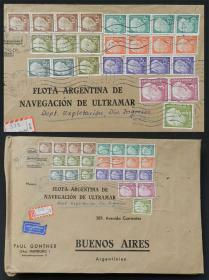 F.VF 6 Postcards posted between 1930 and 1995, most to Argentina, with nice cancels (of a ship at sea in 1930, others very thematic), or pretty frankings, fine quality! VF. 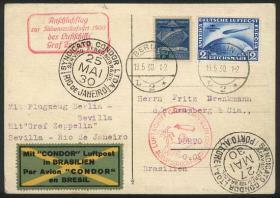 Berlin (19/MAY/1930) - Porto Alegre (27/MAY): Postcard franked with German stamp of 2RM. 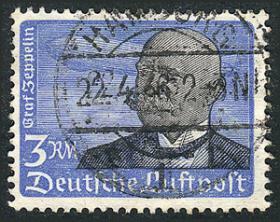 blue of Südamerika Fahrt and 2000 Rs. 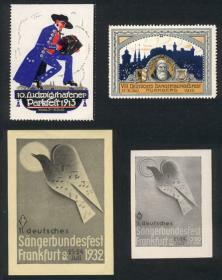 of Syndicato Condor (mixed postage), both postmarked in Berlin, with several other postal markings, excellent! 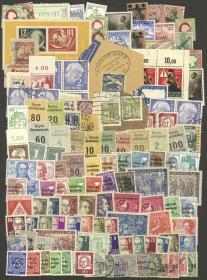 Fine Over 55 covers, cards, etc., most used between circa 1932 and 1970, and almost all sent to Argentina. There are nice frankings, fine general quality! VF. 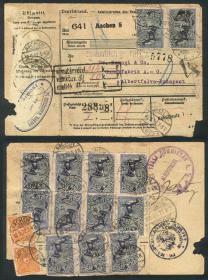 23/SE/1932 Berlin - Asunción (Paraguay): ZEPPELIN cover franked with 2Mk. and special marks, arrival backstamp, excellent quality! 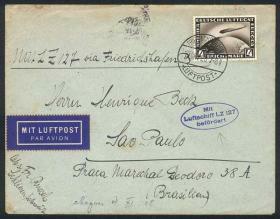 NOTE: covers flown by Zeppelin to Paraguay are scarce! VF. 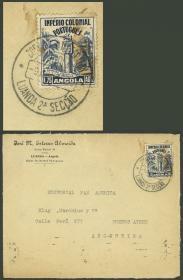 25/SE/1932 Stuttgart - Asunción (Paraguay): ZEPPELIN cover franked with 2Mk. and special marks, arrival backstamp, excellent quality! 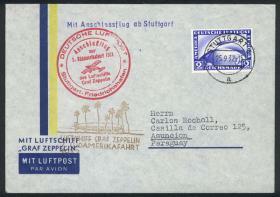 NOTE: covers flown by Zeppelin to Paraguay are scarce! Fine Cover sent to Argentina by AIR FRANCE on 10/JUL/1934, franked with 1.85 Mk., with Paris transit backstamp, interesting! VF. 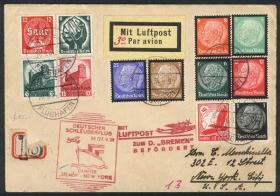 20/SEP/1934: Cover carried by steamship Bremen, and catapulted to New York, very fine quality! VF. 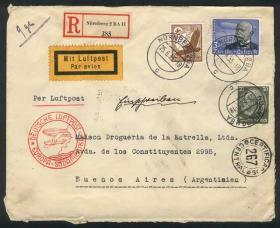 Cover sent from Nürnberg to Argentina on 25/JUN/1935 by registered air post, franked with RM 3.55, very fine quality! VF. 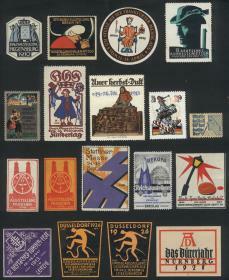 Cover of the year 1936 with postmark related to the OLYMPIC GAMES, VF quality! VF. 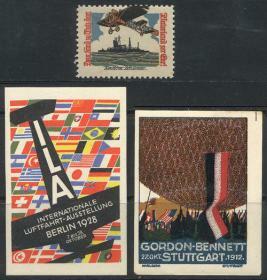 Special postcard of the World Congress for Leisure Time & Recreation held in Hamburg, sent to Argentina on 27/JUL/1936, with postage and special cancels of the Congress, VF quality! 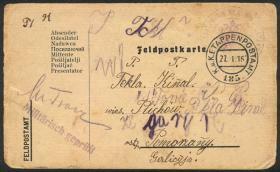 F.VF Postcard franked with 8Pf. 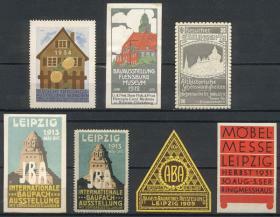 and sent to Stuttgart, with interesting rectangular cancel of Ulm. VF. 12Pf. 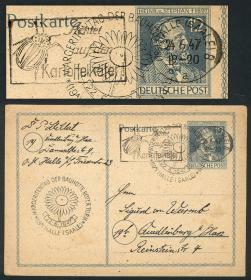 Postal card used on 22/JUN/1947, with nice postmark of Halle topic INSECTS (beetle), VF quality! 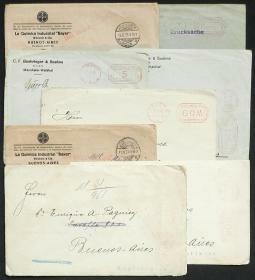 Fine 64 Covers or cards used in varied periods, many sent to Argentina. 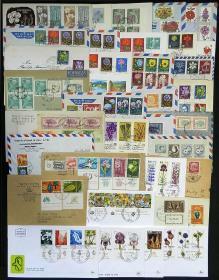 There is a wide range of postages and postal markings, interesting! IMPORTANT: please view ALL the photos of this lot, because all the covers have been scanned. 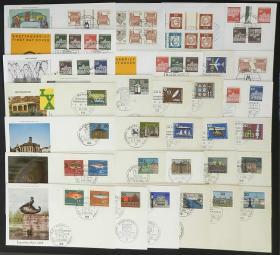 F.VF 1952/1987: Interesting group of 75 covers sent to Argentina, very nice postages, good lot for the especialist! VF. 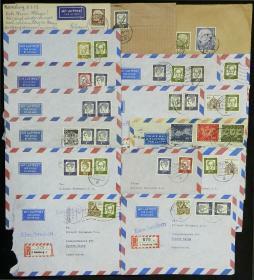 Large cover sent by registered air post to Argentina on 8/JA/1958, with colorful postage of DM 8.60 (7 different stamps of the Heuss issue), VF quality, fantastic! VF. 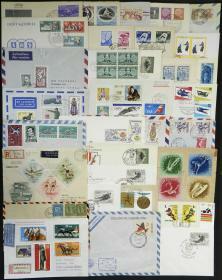 Large cover sent by registered air post to Argentina on 8/MAR/1958, with colorful postage of DM 21.60 (8 different stamps of the Heuss issue, most in strips of 3 or 4! 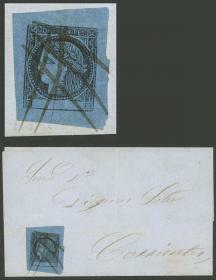 ), VF quality (2 stamps with defects), fantastic! VF. 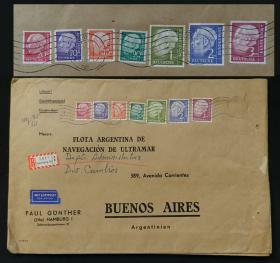 Large registered air mail cover sent to Argentina on 25/SE/1958, franked with DM 7.60, excellent quality! VF. 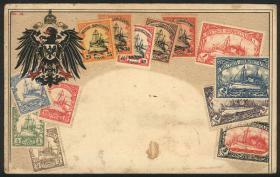 Large cover sent by registered air post to Uruguay on 13/SE/1958, with colorful postage of DM 10.30 (8 different values of the Heuss issue, several in pairs), fantastic, very fine quality! VF. 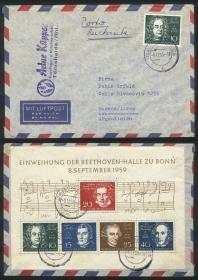 Cover franked on reverse with souvenir sheet of 1959 commemorating BEETHOVEN, sent to Argentina on 9/NO/1959, excellent quality! VF. 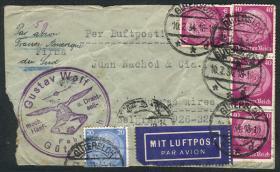 1962/64 LUFTHANSA FLIGHTS: 16 First-flight or special-flight covers, varied destinations, postages and postmarks, VF general quality! 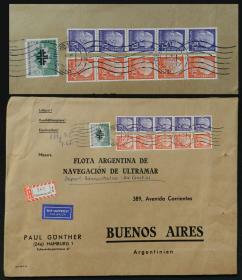 Fine 17 Covers sent to Argentina in the 1960s, most of fine quality! 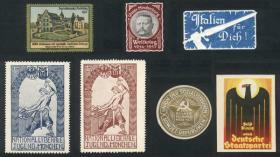 F.VF GERMAN STATES: Interesting lot of old stamps, most used and almost all of fine to VF quality. Completely unchecked, surely the expert will find scarce stamps and interesting and rare cancels, HIGH CATALOGUE VALUE, good opportunity! 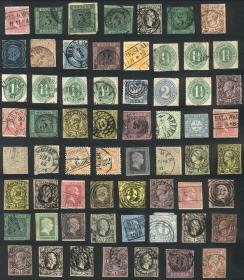 F.VF Very interesting lot of old stamps, almost all used, most of fine to VF quality, COMPLETELY UNCHECKED (it may include rare cancels, scarce colors and varieties! ), Scott catalog value over US$3,000, good opportunity at low start! 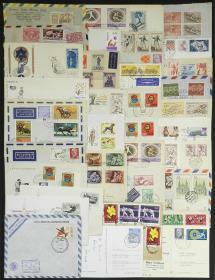 Ave-Fine Lot of stamps and souvenir sheets of varied countries and periods, used or mint (they can be without gum), mixed quality (from some with defects to others of VF quality), it may include reprints or forgeries, all the same a very interesting lot with high retail sale value, good opportunity at low start! 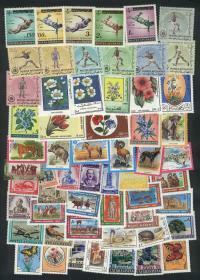 F.VF CUT SQUARES: Old collection on pages, large number, VF quality! 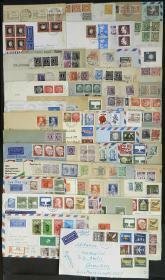 IMPORTANT: please view ALL the photos of this lot, because all the cut squares have been scanned. VF. 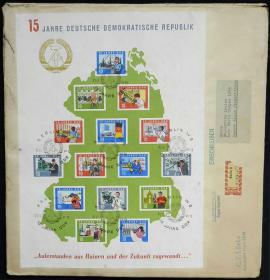 ZUSAMMENDRUCKE: Collection in KA-BE album of several hundreds pairs and strips of stamps with labels, advertising tabs, tete-beche, etc., used and in general of very fine to excellent quality. 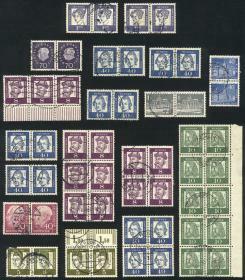 Up to the year 1941, from the year 1931 it is virtually complete (very few values are missing), and in earlier issues there several very rare examples of high catalog value, overall Michel catalog value over Euros 16,000. Excellent opportunity to start this fascinanting chapter or for retaill sale with important profits! ATTENTION: Please view ALL the photos, because all the "Zusammendrucke" have been scanned. Heavy lot, the shipping costs worldwide from Argentina will be between US$40/50, please take this into account before placing your bid. 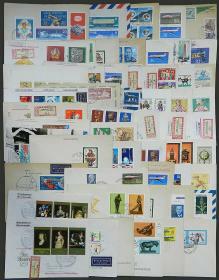 F.VF Many thousands stamps (most used) in a box, fantastic stock COMPLETELY UNCHECKED, surely including varieties and good postmarks, VERY HIGH CATALOG VALUE, good opportunity at low start! 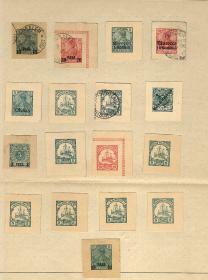 F.VF Lot of used stamps of the inflation period, some in strips or blocks, general quality is fine to very fine, high Michel catalog value, good opportunity! 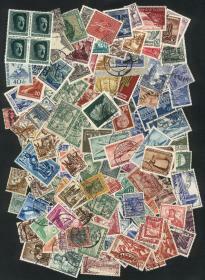 F.VF Lot of used stamps, very fine general quality, HIGH CATALOG VALUE (I estimate over Euros 2,000), good opportunity! 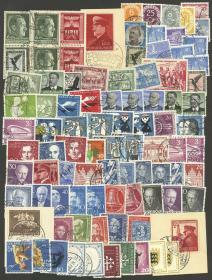 F.VF Lot of stamps of varied periods, including Sarre, West Germany, Berlin, Reich etc., most used and of very fine quality. Yvert catalog value approx. 850, good opportunity at a low start! VF. 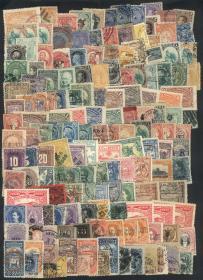 Small lot of MNH stamps, excellent quality, low start! VF. Lot of used PAIRS and BLOCKS, from sheets and not coils, Michel catalog value Euros 950+, very fine quality, good opportunity at a low start! 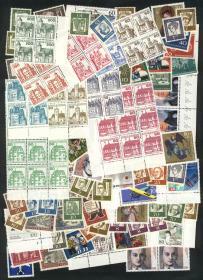 F.VF Lot of used PAIRS and BLOCKS on fragments, from sheets and not coils, Michel catalog value Euros 1,000+, very fine quality, good opportunity at a low start! 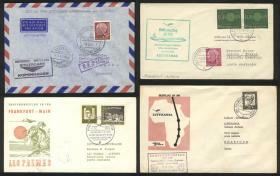 Fine Lot of FDC covers and covers with special postmarks of the 1960s, several with tete-beches and gutters, interesting! VF. 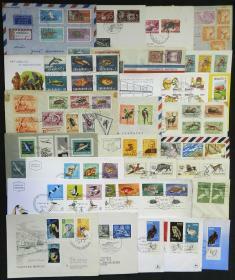 Lot of modern stamps, all never hinged and of very fine quality, Yvert catalog value approx. 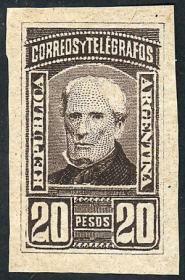 Euros 190. F.VF Bayer. 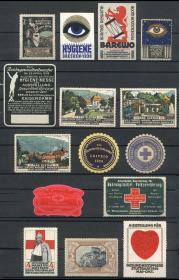 Staatseisenb., set of 10 parcel post stamps, mint no gum, fine to VF quality! 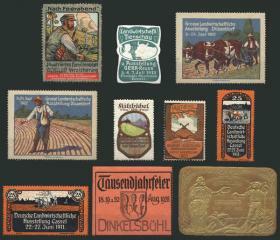 F.VF AGRICULTURE, RURAL: 10 Old interesting cinderellas, fine to very fine quality! 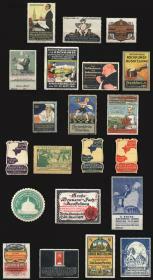 F.VF FOOD, COOKING: 21 Old interesting cinderellas, fine to very fine quality! 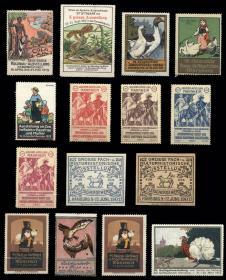 F.VF ANIMALS: 15 Old interesting cinderellas, fine to very fine quality! F.VF ART, THEATER: 9 Old interesting cinderellas, fine to very fine quality! F.VF AVIATION: 3 Old interesting cinderellas, fine to very fine quality! 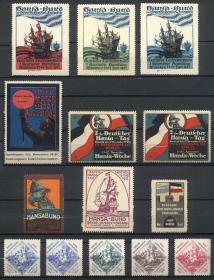 F.VF SHIPS, SAILING BOATS, etc. : 14 Old interesting cinderellas, fine to very fine quality! F.VF CASINO, LOTTERY: 2 Old interesting cinderellas, fine to very fine quality! F.VF FILM, PHOTOGRAPHY, RADIO: 3 Old very nice cinderellas, fine to very fine quality! 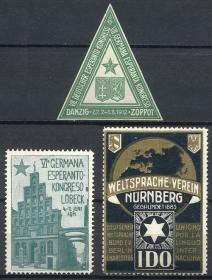 F.VF ESPERANTO: 3 Old interesting cinderellas, fine to very fine quality! F.VF HEILBRONN AUSSTELLUNG, 1897 Exposition: 3 Old interesting cinderellas, fine to very fine quality! F.VF INDUSTRY, SCIENCE: 10 Old interesting cinderellas, fine to very fine quality! F.VF FLOWERS, GARDENING: 11 Old interesting cinderellas, fine to very fine quality! F.VF BOOKS, PRINTING, PRESS, LITERATURE: 23 Old interesting cinderellas, fine to very fine quality! F.VF MEDICINE, HEALTH: 15 Old interesting cinderellas, fine to very fine quality! 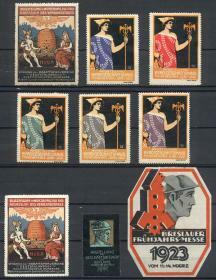 F.VF MYTHOLOGY (MERCURY): 9 Old interesting cinderellas, fine to very fine quality! 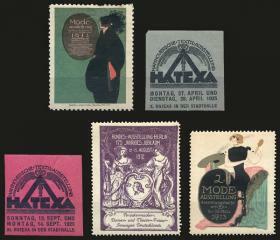 F.VF FASHION, TEXTILES: 5 Old interesting cinderellas, fine to very fine quality! F.VF MUSIC: 4 Old interesting cinderellas, fine to very fine quality! 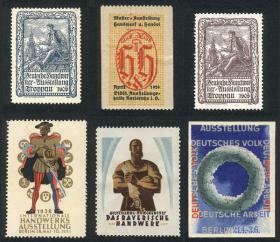 F.VF POLITICS: 7 Old interesting cinderellas, fine to very fine quality! 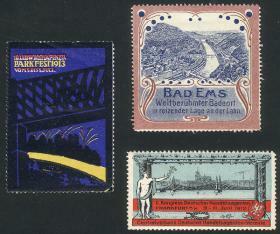 F.VF BRIDGES: 3 Old interesting cinderellas, fine to very fine quality! F.VF WORK, LABOR, WORKERS: 15 Old interesting cinderellas, fine to very fine quality! 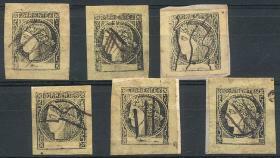 F.VF WORK, LABOR, WORKERS: 6 Old interesting cinderellas, fine to very fine quality! 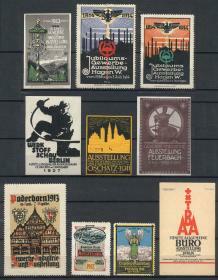 F.VF TOURISM, 1929 Dresden Exposition: 3 Old interesting cinderellas, fine to very fine quality! 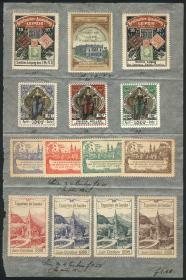 F.VF HOUSING, CONSTRUCTION: 7 Old interesting cinderellas, fine to very fine quality! F.VF 14 Old interesting cinderellas, VARIED TOPICS, fine to very fine quality, glued to a sheet, they will have to be washed off (and will lose the gum), very nice! F.VF 37 Old interesting cinderellas, VARIED TOPICS, fine to very fine quality! F.VF 36 Old interesting cinderellas, VARIED TOPICS, fine to very fine quality! VF. 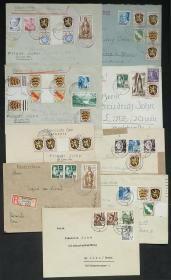 1946/1947: Group of 9 covers with interesting postages, several are registered, very fine quality! 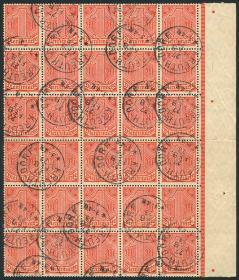 F.VF 2 Aerograms of 60Pf. and 100Pf. 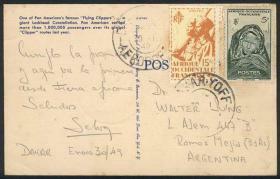 sent to Argentina in 1948 and 1949, with minor defect in the back flap (2 filing holes), superb front, interesting! VF. 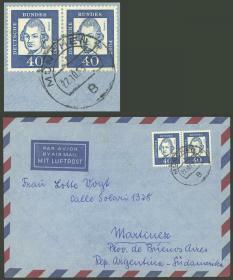 2 Reply paid postal cards sent from Denmark and Sweden to Karlsruhe in JA/1959, with very well applied dispatching cancels, excellent quality! VF. 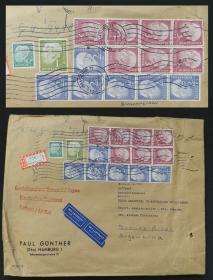 Airmail cover sent to Argentina on 22/OC/1963, franked with HORIZONTAL PAIR of Michel 355, VF quality! 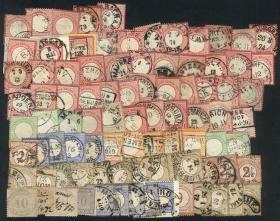 F.VF Over 70 covers sent to Argentina between 1950 and 1960 with attractive and very varied postages, very interesting lot for the specialist, low start! IMPORTANT: please view ALL the photos of the lot, because all the covers have been scanned. 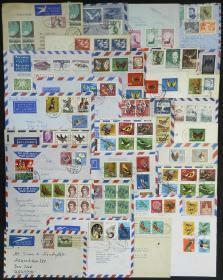 F.VF Over 70 covers, cards, etc., most used between circa 1956 and 1970, and almost all sent to Argentina. 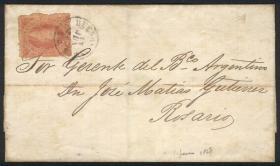 There are nice frankings, fine general quality! 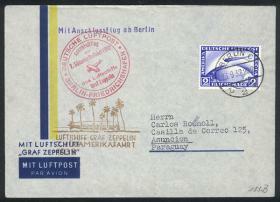 Fine Registered cover that contained printed matter sent from Berlin to Argentina on 21/DE/1964, franked with souvenir sheet Michel 19 ALONE, extremely rare on used cover! VF. 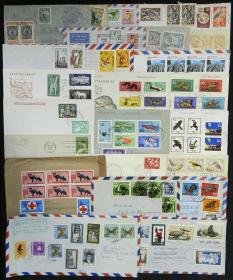 Lot of VERY THEMATIC stamps and sets, mint never hinged and of excellent quality, catalog value approx. Euros 250, good opportunity at a low start! 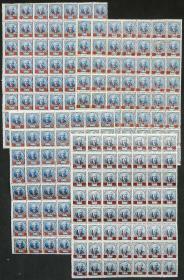 Fine AMERICAN COUNTRIES: Interesting lot of mint (can be without gum) and used stamps, from varied periods, most of fine quality (some may have minor defects), HIGH CATALOGUE VALUE, good opportunity at low start! VF. 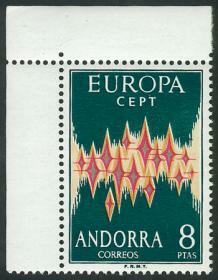 Yvert 64A, 1972 Topic Europa, corner single, MNH, excellent quality! 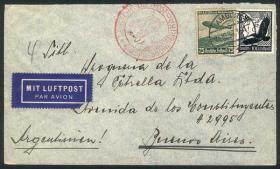 F.VF Cover front sent from Luanda to Argentina on 9/NO/1938, unusual destination, nice franking! 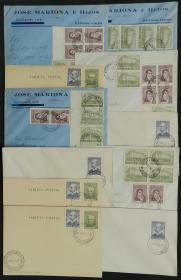 F.VF 11 Covers or cards with postmarks of ORCADAS DEL SUR for 14/FE/1943, VF quality, low start! VF. Yvert 202/15 (not consecutive), 1950/4 Queen Juliana, 8 values of the set in mint blocks of 4, most MNH (2 stamps lightly hinged), fine to VF quality, catalog value Euros 126. VF. GJ.16a, 4R. dark green, DOUBLE IMPRESSION (both impressions are fairly overlapping, the variety is clearly notable in the letters REALES and FRANCO), handsome color, very fresh, superb! VF. 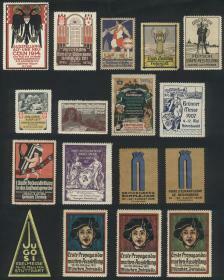 GJ.17, 1P. blue, splendid mint example WITH TOP SHEET MARGIN, very fresh and attractive, excellent quality! VF. 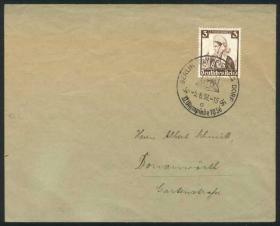 GJ.3, type 3, franking an undated folded cover sent to Corrientes, with very attractive pen cancel, VF quality! VF. 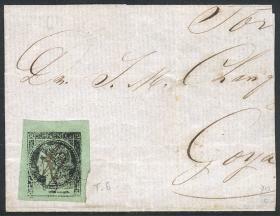 GJ.4, yellow-green, beautiful single of very wide margins, on large part of a folded cover, with an attractive pen cancel of origin to be determined, VF! VF. 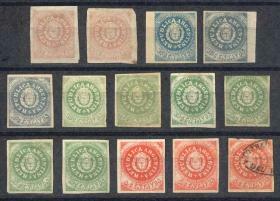 GJ.6, yellow and lemon yellow, 6 examples with varied pen cancels, VF quality and very interesting! VF. 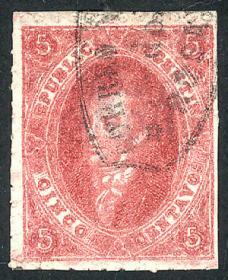 GJ.8, dull rose, superb example with interesting violet pen cancel! VF. 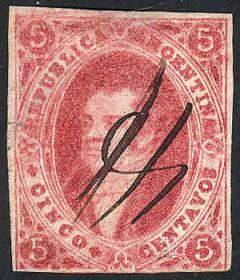 GJ.11, rose, with circular datestamp of Corrientes, superb, signed by Victor Kneitschel on back! VF. 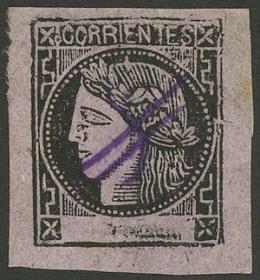 GJ.12, brick-rose, used in Corrientes on 30/JA/1877, superb quality! 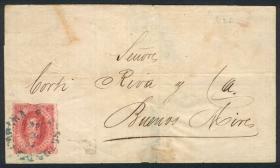 Fine GJ.13, dull rose, beautiful example on almost complete cover sent to Concepción, with attractive pen cancel, very nice! 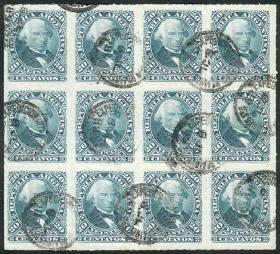 Multiple / Mint or NH Cat.#: GJ.2 var. VF. GJ.2, 10c. 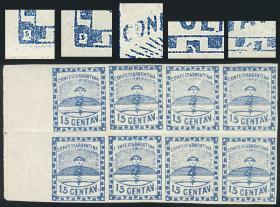 small figures, strip of 4 from composition A (3 stamps MNH) with VARIETIES: "top right corner bent", "Greek pattern broken below the N in CENTAV", AND "outline of the oval broken, above the hat", excellent quality, rare! 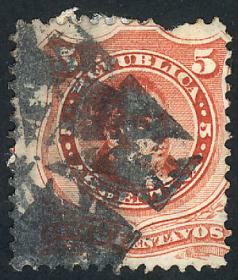 Pair / Mint or NH Cat.#: GJ.2 var. VF. GJ.2, 10c. 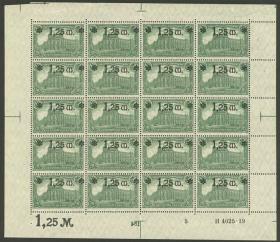 green, pair with VARIETY: "spot between both stamps, in the lower border", excellent quality! VF. GJ.3f, 15c. 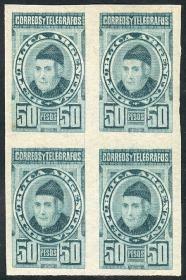 small figures, strip of 3, the central stamp with variety "Greek pattern incomplete and lower frame line omitted", and the left example with variety: "White lines over NT and lower pattern", MNH (+50%), excellent quality! 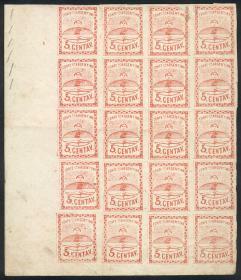 Multiple / Mint or NH Cat.#: GJ.3 var. VF. GJ.3, 15c. 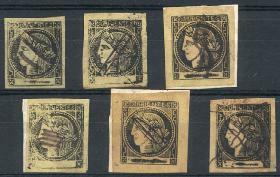 small figures, strip of 4 with very nice varieties: "Greek pattern at top defective" (2nd stamp), and "worn areas in the lined background inside the oval, arm and lower border of the oval" (3rd stamp), these 2 stamps are MNH, the examples at the ends are very lightly hinged, excellent quality! 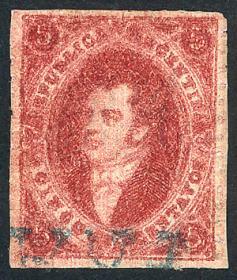 Multiple / Mint NH (Virgin Gum) Cat.#: GJ.3 var. VF. GJ.3, 15c. 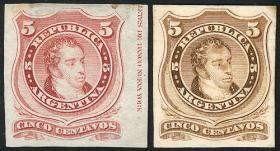 small figures, strip of 4 with very nice varieties in the 3rd stamp: "AROENTINA" and "spot in the top border, above the N of ARGENTINA", the other examples also have varieties, for example "top left angle colored" (1st stamp) and "Greek pattern incomplete at top" (4th stamp), excellent quality, MNH (one with tiny hinge mark), very fresh and attractive! F.VF GJ.4 + 4d, 5c. 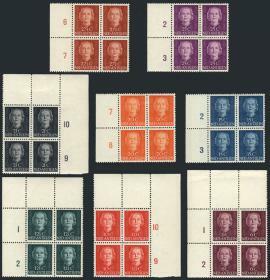 large figures, corner block of 20, the 5 stamps on the right with variety "Line below the EN interrupted, 4th stamp in rows 7 to 12 on plate B", MNH (a few lightly hinged), VF general quality (4 stamps with crease), very attractive! 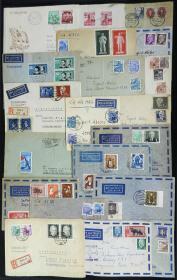 Fine FORGERIES: interesting lot of stamps with forged cancels, several very well made, very useful for study! 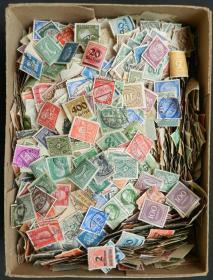 Ave-Fine FORGERIES: interesting lot of forged stamps, very useful for study! VF. GJ.7, 5c. rose, beautiful mint block of 6 stamps, with plate WEAR, excellent quality! 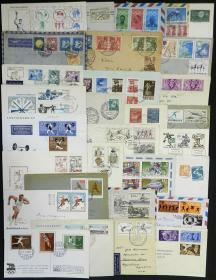 F.VF Lot of stamp FORGERIES, some are very well made, interesting group to study and compare! VF. GJ.8, 10c. 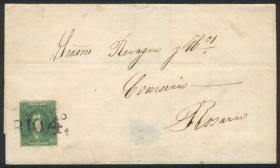 yellow-green, with very wide margins, on fragement used in Buenos Aires on 23/OC/1863, fresh, good color, perfect, superb! VF. GJ.10, 5c. 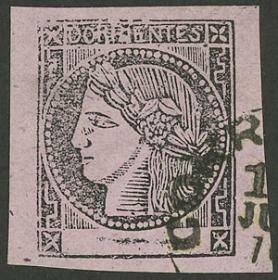 rose, without accent, corner block of 4 with VARIETIES: "Dark spot on the top margin, above the C" (position 1), and "R in REPUBLICA defective + white spot below the A in CENTAVOS" (position 2), mint no gum, VF quality! VF. GJ.10, 5c. without accent, fantastic SHEET CORNER example with FULL ORIGINAL GUM, very fresh, perfect and spectacular! VF. 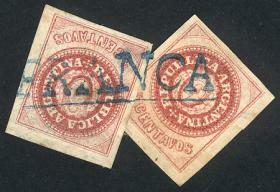 GJ.10, vertical pair cancelled FRANCA, one with minor defect on reverse, excellent appeal! 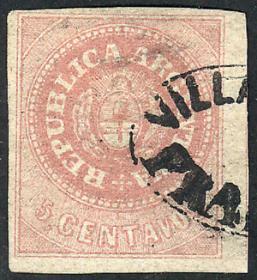 Fine GJ.10, with oval VILLA NUEVA - FRANCA cancel, tiny thin on back, superb front, extremely rare! 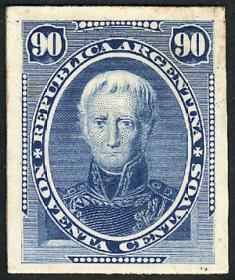 Fine GJ.10, with straightline GUALEGUAY cancel in blue (+200%), tiny defect, very handsome! VF. GJ.12, 5c. semi-worn plate, carmine-rose, on fragment, superb! VF. GJ.12, 5c. 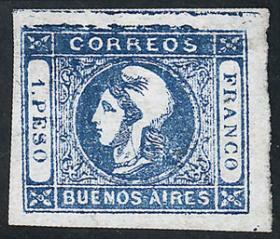 without accent, semi-worn plate, 2 examples reconstructing the FRANCA cancel of Rosario in blue (+75%), VF quality! VF. 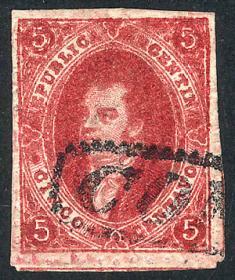 GJ.15, beautiful example in bright red, on fragment with CONCORDIA cancel, excellent! VF. GJ.15, 5c. with narrow C, wide margins, superb! 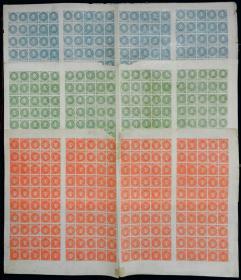 F.VF Lange FORGERIES: Set of the 3 values with narrow C, printed in sheets with 4 groups of 50 examples (in total 200 stamps of each value), mint no gum, very fine quality (with some minor faults normal in blocks of this type), very interesting for study, rare and probably the only ones in existence in complete sheets! VF. 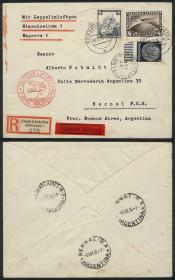 GJ.20, 3rd printing franking a cover sent to Buenos Aires, with the rare cancel of messenger agency of Felipe Picot, Villa Mercedes in triple oval, along rectangular handstamp with the address of the agent in B.Aires, VF! 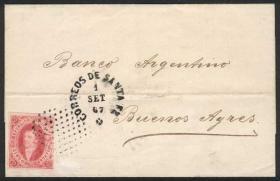 Fine GJ.20, 3rd printing, franking an entire letter sent from Salta to Buenos Aires on 15/MAY/1865, with small oval SALTA cancel. Very interesting long text about the concerns of an "invasion of paraguayans via Esquina Grande", the scheming with the Cuerpo Cívico: "...it has given rise to new resentment, because all the officers that do not support this Government, even the Colonels, have been placed as soldiers. The punishment for not attending the exercises is, the first time, 4 days´ arrest or a fine of 2 pesos...", very attractive! F.VF GJ.23, 10c. 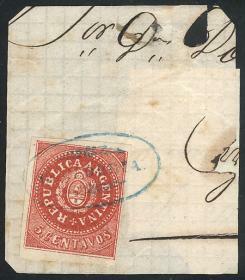 worn impression (minor defect), franking an entire letter sent from Salta to Buenos Aires on 11/FE/1867, with very worn rococo cancel, very attractive and fresh. The text of the letter is interesting, about the political situation! VF. GJ.23BI, 10c. Bisect franking a folded cover sent to Goya, pen cancelled on arrival, VF quality and very rare, with Alberto Solari certificate and signed by Victor Kneitschel! VF. 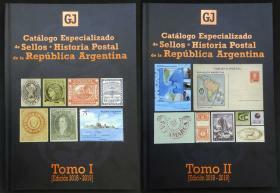 GJ.25, 4th printing, used in Rosario, superb example! 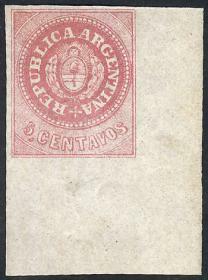 Fine GJ.25, 4th printing, franking a folded cover dated Santa Fe 7/OC/1866, but for some reason it was dispatched on 28/OCT in PARANÁ (blue rimless datestamp, +30%), to Buenos Aires, fine quality, interesting! VF. 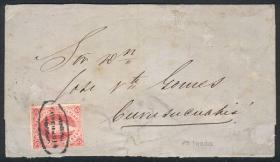 GJ.25, 4th printing, red-rose, absolutely superb stamp franking a folded cover sent from PARANÁ to Santa Fe on 1/MAR/1866, excellent quality! VF. GJ.26, 5th printing, example of exceptional quality, splendid, perfect piece for the most demanding collectors! VF. 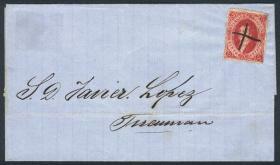 GJ.26, 5th printing, franking a folded cover to Tucumán, with interesting pen cancel, possibly of the province of Jujuy, VF quality! VF. GJ.26e, 5th printing, ribbed paper, with FRANCA cancel of Goya, superb! 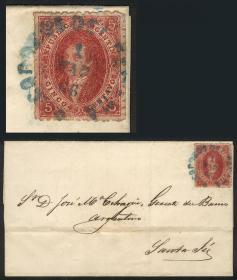 F.VF GJ.26Ab, 5th printing cerise-carmine, parchment-like paper, beautiful example franking a very long entire letter sent from Salta to Buenos Aires on 11/MAY/1867, with rococo cancel. The text is very long, written by a mother to her son, she writes about the plague ravaging Buenos Aires and the need to hear from him, also about how busy the judge is with the issue of the "montoneros", etc. Very attractive! VF. 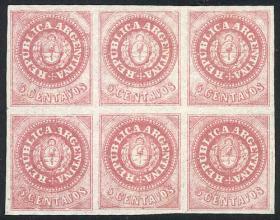 GJ.28A, 6th printing perforated, orangish dun red color, on a folded cover sent from Buenos Aires to Rosario on 17/JUN/1867, VF quality, with Alberto Solari certificate, catalog value US$1,000. 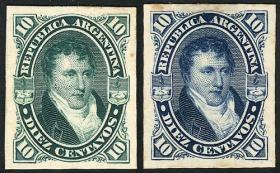 Fine GJ.32, 7th printing imperforate, nice example with rare pen cancel of GOYA, minor defect, very good appearance, very scarce cancellation on Rivadavias! 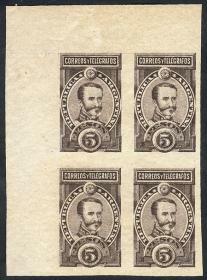 Fine GJ.32, 7th printing imperforate, on complete folded letter dated 29/DE/1867, to Curuzú Cuatiá, with black ellipse CONCORDIA cancel very well applied, fine quality, catalog value US$600. VF. 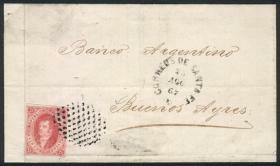 GJ.32, 7th printing imperforate, on folded cover to Buenos Aires, with dotted cancel along datestamp of SANTA FE 25/AU/1867, VF quality! VF. 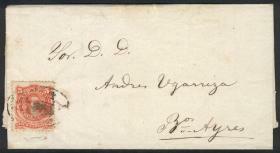 GJ.32, 7th printing imperforate, example of 4 margins (3 very wide) on a folded cover , dotted cancel (+30%) and datestamp of SANTA FE 1/SE/1867, superb! VF. 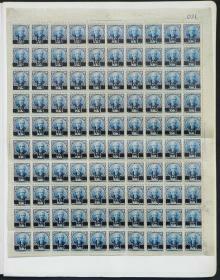 PALEY REPRINTS: the complete set of 3 sheets, made in the year 1988 with the original "cancelled" plates, 5c, 10c and 15c., in its original folder, excellent quality! VF. GJ.37, 5c. 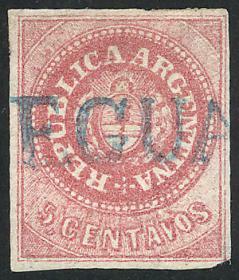 Rivadavia with groundwork of horiz lines, franking an entire letter from Salta to Buenos Aires on 28/NO/1867, with rococo cancel. Interesting text, about the problems caused by the "montoneros" that have entered the country, the looting by Navarro and his "catamarqueños" in Jujuy (and that Salta was also being plundered by Varela´s allies, who supposedly were "friends" of the Salta people), a wine request, etc. Very fine quality, very attractive! VF. GJ.37, 5c. 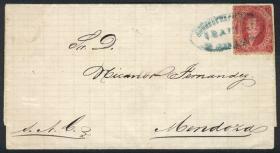 Rivadavia with groundwork of horiz lines, franking an entire letter from Salta to Buenos Aires on 21/DE/1867, with rococo cancel. Interesting text, about the political intrigues before the election, the schemes to disarm them, and the ambitions to win the elections. Very fine quality, very attractive! VF. GJ.37, 5c. 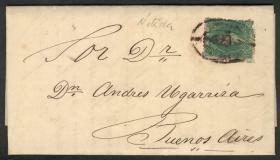 Rivadavia with groundwork of horiz lines, franking an entire letter from Salta to Buenos Aires on 13/FE/1868, with rococo cancel. Interesting text, about a wine request for the father of the addressee that cannot live without it, a good paragraph about the political intrigues in the province, the arrival of the printing press for the newspaper (but the "cajistas" that were organizing it were taken by the soldiers and released under oath that they would not work for the opposition!! ), reprisals against the population for the activity of the opposition, etc. Very fine quality, very attractive! 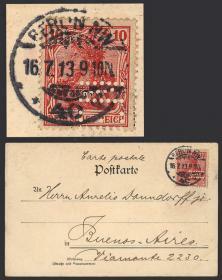 F.VF GJ.37, trial color proof in red printed on very thin paper (India paper) + proof in yellow-chestnut printed on card, rare! Ave-Fine GJ.38, with an extremely rare mute cancel (squared wedges without center), probably of BRAZIL, very attractive! 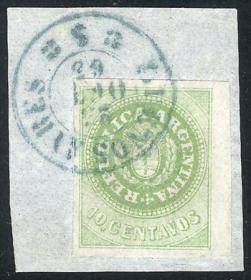 F.VF GJ.39, proof in green (issued) + trial color proof in blue, both printed on card, rare! VF. 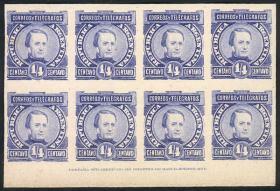 GJ.44, proof in the adopted color printed on card, VF quality, rare! VF. 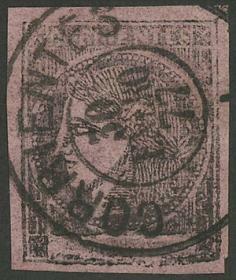 GJ.51, 1876 20c. 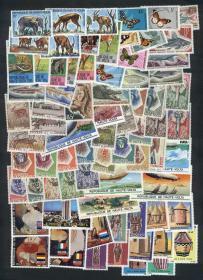 Velez Sarsfield, rouletted, large used block of 12 stamps, excellent quality, rare! VF. GJ.96, ¼c. Paz, TRIAL COLOR PROOF in ultramarine blue, block of 8 printed on card, with lower sheet margin and printer imprint, excellent quality, very nice! VF. GJ.96, ¼c. Paz, TRIAL COLOR PROOF in dark orange, block of 8 printed on card, with lower sheet margin and printer imprint, excellent quality, very nice! VF. 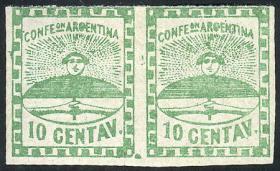 GJ.110, pair with interesting blue datestamp of SALTA, VF quality! VF. GJ.116, 1889 5P. Lamadrid, TRIAL COLOR PROOF in very dark chestnut, printed on thin, yellowish paper, excellent quality, very rare! VF. 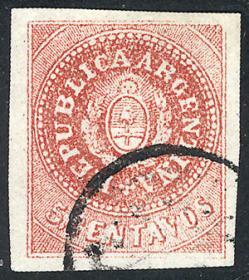 GJ.116, 1889 5P. 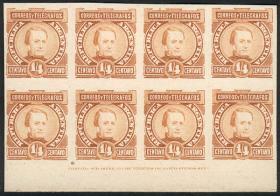 Lamadrid, TRIAL COLOR PROOF in very dark chestnut, block of 4 printed on thin, yellowish paper, excellent quality, very rare! VF. GJ.118, 1889 20P. Brown, TRIAL COLOR PROOF in very dark chestnut, printed on thin, yellowish paper, excellent quality, very rare! VF. 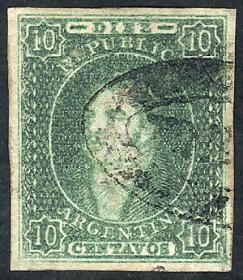 GJ.119, 1889 50P. 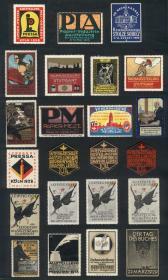 Dean Funes, TRIAL COLOR PROOF in very dark chestnut, printed on thin, yellowish paper, excellent quality, very rare! VF. 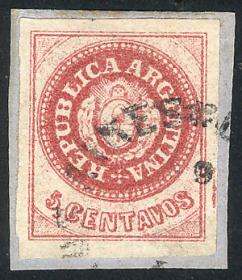 GJ.119, 1889 50P. 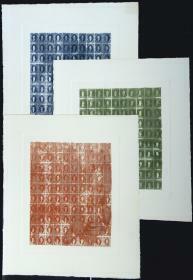 Dean Funes, TRIAL COLOR PROOF in blue-green, block of 4 printed on thin, yellowish paper, excellent quality, very rare! VF. 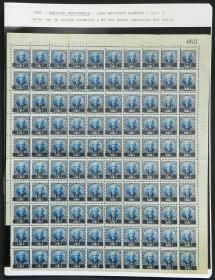 GJ.133, 1890 ¼c. on 12c. 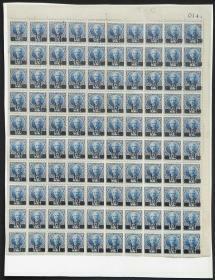 bright blue, black overprint, perf 11½x12, MNH sheet of 100 stamps, excellent quality, rare. 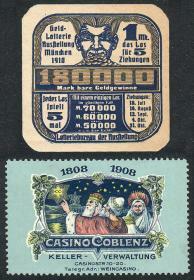 Fine GJ.133c, 1890 ½c. on 12c. 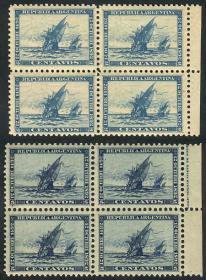 with black overprint, complete sheet with 80 stamps with variety: DOUBLE IMPRESSION OF THE STAMP, and 20 normal examples (the last 2 columns), MNH (a few lightly hinged), VF quality (a few with light stain spots on gum), LARGEST PIECE of this variety, excepcional rarity, catalog value US$3,200+, good opportunity! 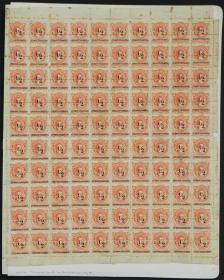 Fine GJ.134, provisional of 1890, red overprint, complete sheet of 100 stamps, almost all MNH (very few with hinge, and less than 10 examples with tiny stain spots on gum), very nice! VF. 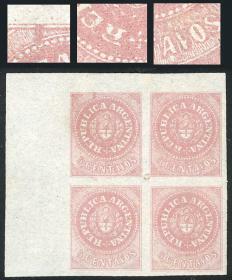 GJ.273, 1902 Port of Rosario, 11 proofs in different colors, printed on thick card (some with glazed front), excellent quality! VF. 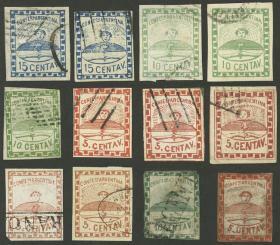 GJ.273, 1902 Port of Rosario, 10 proofs in different colors, blocks of 4 printed on thick card of glazed front, excellent quality!